Eastern Europe witnessed 14 million deaths in the period of Second World War, between 1933 and 1945. The local impact of such widespread and wanton killing as it reverberated in towns, villages, and communities over the subsequent decades is only just beginning to be considered, prompted by new scholarly attention to the East European ‘Bloodlands’ (1), the ‘Holocaust by Bullets’(2), the proliferation of smaller ghettoes and camps (3), and the excruciatingly intimate relations of betrayal, killing, expropriation, and rescue (4). It can be assumed that every community produced artistic responses to that traumatic memory, but Holocaust scholarship’s new Eastward and grassroots turns have yet to attend seriously to vernacular arts of witness. But in the field of Holocaust artistic production, local, ‘naïve’ artists may have been the most prolific group attempting to represent the events they witnessed. 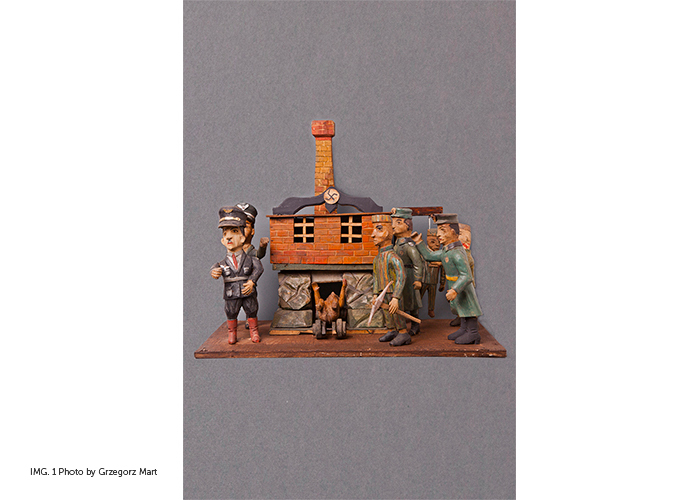 Their works, however, remain scattered in folk museum collections, often awkwardly categorized due to disciplinary taxonomies that treat folk art as ‘timeless’ rather than historical, and the reluctance of curators to touch on uncomfortable subjects. The objects themselves are uncanny: at times deeply moving, at others grotesque, they can also be disturbing for the ways they upend accepted roles of victim, perpetrator, and bystander; impose Catholic idioms on Jewish suffering via symbolic forms like a Pietà or a Nazi crematorium recalling a nativity crèche; and incorporate desecrated Jewish sacred texts – as well as for the erroneous mythologies that may be projected onto them as memorial objects in the present. Through a survey of objects in Polish ethnographic museums — as well as other Polish and German public and private collections —, the creation of a public database, and the development of collaborative, arts-based interventions, we aim to highlight and re-frame this vernacular art of witness for Polish and international publics. The ultimate goal of the project is to re-frame and draw new attention to this fascinating, under-recognized category of object in order to: 1) broaden what we understand as ‘Holocaust art’; 2) expand the field of Holocaust memory studies to include a range of ‘bystander’ perspectives; and 3) challenge traditional approaches to folk art and ethnographic museology more broadly. Our project is in dialogue with larger debates about ‘difficult heritage’ (5) and the productive possibilities for curating ‘difficult knowledge’ (6) that challenge received ideas about and relationships to violent histories, using creative, collaborative approaches that engage broad audiences. We seek to support the development of pluralist identities that simultaneously embrace legacies of victimhood, perpetration, and other positions of witness. Recognizing museums as both complex power structures and potentially democratizing sites for cultural knowledge production, we also strive to loosen authoritative approaches to the categorization and curation of culture, and develop new strategies for institutional self-critique by both internal and outside assessments, interventions, and partnerships. (1) Timothy Snyder, Bloodlands: Europe between Hitler and Stalin (New York: Basic Books, 2010). (2) Patrick Desbois, Porteur de mémoires: sur les traces de la Shoah par balles (Paris: Michel Lafon); Patrick Desbois,The Holocaust by Bullets: A Priest’s Journey to Uncover the Truth behind the Murder of 1.5 Million Jews (New York: Palgrave Macmillan, 2009). (3) USHMM Encyclopedia of Camps and Ghettos, planned volumes I-VII by 2025, editor Geoffrey P. Megargee, Martin Dean (Indiana University Press and USHMM). (4) Jan Tomasz Gross, Neighbors: The Destruction of the Jewish Community in Jedwabne, Poland (Princeton NJ: Princeton University Press, 2001); Jan Tomasz Gross, Fear: Anti-Semitism in Poland After Auschwitz (New York: Random House, 2006); Jan Tomasz Gross, Irena Grudzińska-Gross, Golden Harvest (New York: Oxford University Press, 2012); Jan Grabowski, Hunt for the Jews: Betrayal and Murder in German-Occupied Poland (Bloomington: Indiana University Press, 2013). (5) Sharon Macdonald, Difficult Heritage: Negotiating the Nazi Past in Nuremberg and Beyond (New York, London: Routledge, 2008). (6) Erica Lehrer, Cynthia E. Milton and Monica Eileen Patterson, eds. Curating Difficult Knowledge: Violent Pasts in Public Places (New York, London: Palgrave, 2011). IMG. 01 | Crematorium (1970). Jan Wojtarowicz, born 1895 in Niecew near Nowy Sącz. 60 cm tall base 67x37cm. Titled by the author ‘Deutshe fabriken’ [German factories]. Collection of the Otrębusy Folk Art Museum, Otrębusy, Poland. Photo by Grzegorz Mart. IMG. 02 | Dr. Janusz Korczak with his orphans on the ruins of the Warsaw Ghetto (circa 1984). Jarosław Furgała, born 1919 in Polwica near Wrocław. 35 cm tall. Collection of the Otrębusy Folk Art Museum, Otrębusy, Poland. Photo by Grzegorz Mart. IMG. 03 | Nazi camp prisoner (1978). Franciszek Skocz, (1908 – 2000), born in Bochotnica, died in Pyrzyce, Poland. 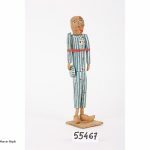 ‘Prisoner number 231.’ 23 cm tall. Collection of the Seweryn Udziela Ethnographic Museum, Krakow, Poland. Inventory number 55467/6 MEK. Photo by Marcin Wąsik. IMG. 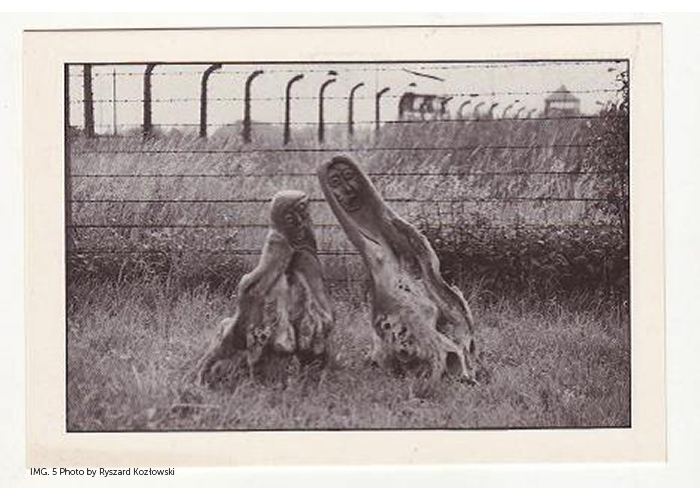 05 | Sculptures posed in front of Auschwitz Concentration Camp (sculptures 1971; postcard 1995). Jan Staszak (1937-1997), born in Brudzewo, died in Harnaży, Poland.Scream [Krzyk, right] and Female Prisoner [Więźniarka, left]. 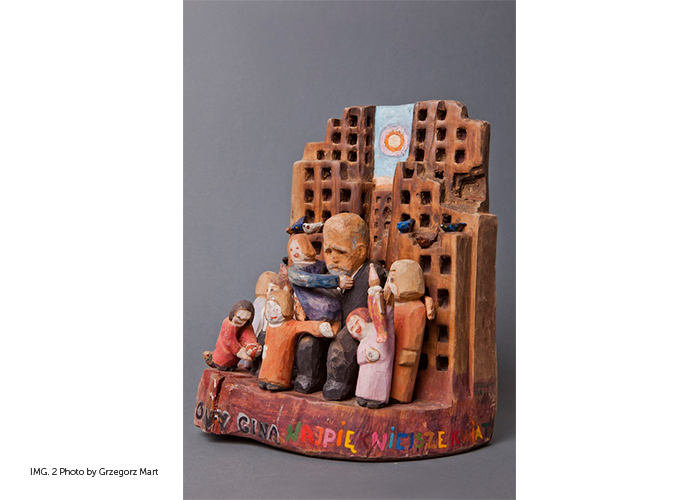 Sculptures from collection of Auschwitz-Birkenau State Museum. Photo by Ryszard Kozłowski.